Lisa Bright excavates the west circle privy. 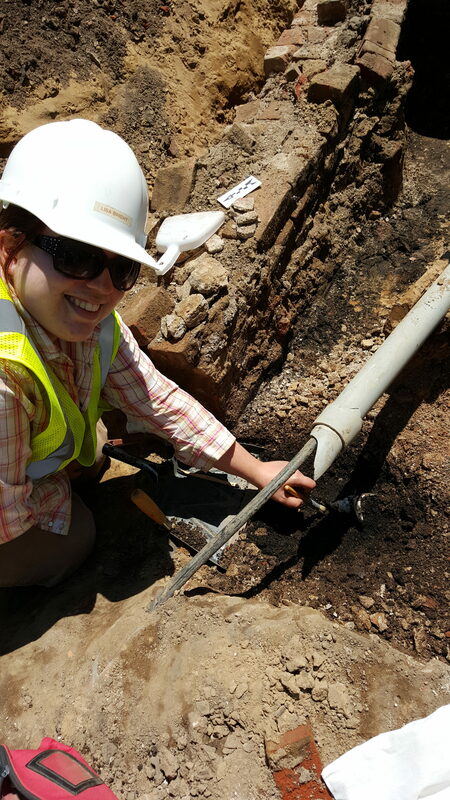 Excavating the West Circle privy – My first summer working for CAP involved monitoring the final phase of the West Circle Steam Tunnel improvement project. Because the construction was in the oldest part of campus we uncovered a large number of areas of archaeological interest including: part of the Engineering Shops, the corner of Williams Hall, the historic steam tunnels, and the privy associated with Saints Rest (Cap had been wondering where the heck all of the outhouses were and why we hadn’t found one yet!). The privy contained a large number of unique artifacts that we were able to study and work with for years (like Mabel and the raspberry seeds). In fact, the larger number of food related items from the privy spurred the historic meal reconstruction project that CAP fellows Susan and Autumn later worked on. 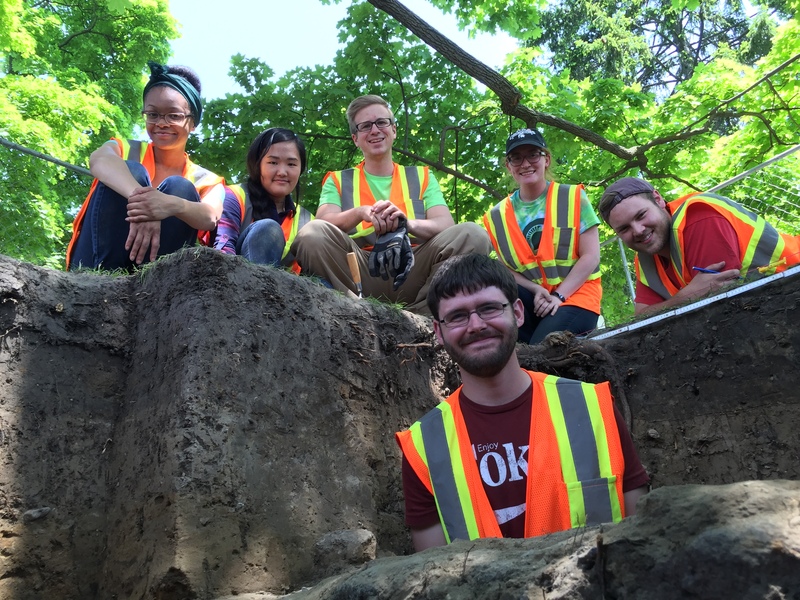 Work with great interns – One of the responsibilities of the campus archaeologist is to manage and teach the undergraduate interns. I was able to oversee 8 interns during my time here, and each was a pleasure to work with. It was fun to be able to teach these undergrads more about historic archaeology, lab practices, and research methods. 2016 Field Crew after finishing the excavation that identified Station Terrace. Manage two CAP field seasons – It was an amazing learning experience to be able to plan and manage two field seasons here on campus. Getting to be part of the process from the initial construction planning phase provided invaluable experience working with both IPF and individual construction companies. With regards to the CAP crew, I couldn’t have asked for a better group of individuals. We covered a lot of ground during those two summers including locating Station Terrace, excavating at the Weather Bureau, putting the first 1×1 m units in at the location of Beal’s Lab, digging behind Old Hort (where the ground was some of the most unforgiving I’ve ever encountered but the crew persisted and made it through), and the Wilson Road realignment survey (where even 300+ mostly negative STPs didn’t destroy the crews morale). Being the TA for the 2017 field school – I must say this was a bit of a surreal experience for me. When I took the Saints Rest field school in 2005, I never imagined that I would one day be the TA for another on campus field school. Once again, this was a great experience in the planning and logistics that occur with a formal field school versus the CRM style summer activity I had previously managed. Outreach – Over the past four years we’ve gotten to engage in some pretty unique types of outreach. We started the Apparitions & Archaeology Haunted Tour in collaboration with the undergraduate paranormal society (which has been a huge success with upwards of 150 people attending), the historic meal reconstruction (the partnership with MSU culinary services has been fantastic and looks like it will be continuing beyond Spring 2018), and the middle school activity kits. CAP really embraces public archaeology, and the ethos of openness has provided a unique experience. Having to adopt the CAP persona and consistently engage with the public was something that took me a little while to get used to, but it’s been really rewarding to see the interest from campus and the wider public in what we do here at CAP. It’s truly been my pleasure to have worked with CAP for the past four years. Being the campus archaeologist has been an invaluable experience, and I know that Autumn Painter (who will be taking over as Campus Archaeologist) will do a great job.